Oct. 12, 2016, 11:05 a.m.
A shift in name (and in geotargeting on digital) is the latest step in the Times’ efforts to build a stronger paying audience outside the United States. By Joshua Benton @jbenton Oct. 12, 2016, 11:05 a.m.
As of yesterday, there was something called the International New York Times. Like any new news brand, they launched with their strongest material: cats. 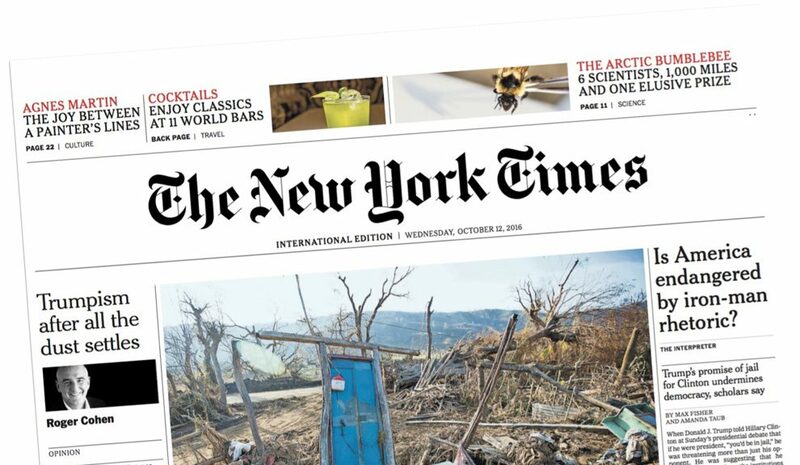 The New York Times Company today introduced The New York Times International Edition, a redesigned, improved and more relevant print newspaper and refreshed digital web experience for our audience outside of the United States. The New York Times International Edition features more international news, an increased focus on deep, analytical reporting, enterprise stories and a broader selection of coverage from The Times including culture, technology, travel and other topics relevant to international audiences. Highlights of The New York Times International Edition include will feature coverage intended specifically for a global audience, similar to Declan Walsh’s Abroad In America series covering the American elections, from a non-American perspective, as well as more Opinion pieces from a variety of global voices. For the first time, The New York Times International Edition will feature Opinion pieces on the front page. The refreshed online experience features one destination for all digital readers of The New York Times: nytimes.com. Site editions are arranged by language (English, Chinese and Spanish). Traffic from inyt.com redirects to nytimes.com. This redesign allows The Times the ability to offer a more personalized experience based on the location of a particular reader. The morning briefing will soon be featured prominently on top of nytimes.com and will be time-zone sensitive, providing relevant information for readers in Europe and Asia. In a letter to readers, publisher Arthur Sulzberger promises there is “much more to come on this front” of geotargeting. @MatthewWells Now 1 homepage, geotargeted. https://t.co/roKt6YkFVA now redirects to https://t.co/8O5DxS4XX7. More personalisation to follow. @MatthewWells I suppose an awful lot of newsflow just before an election is US focused. While the Times has seen great success with its digital paywall model — with over 1.2 million paying digital subscribers — at some point, it’ll saturate the potential paying audience in the United States, which is why seeking international growth makes sense. But there are questions about the degree to which the outside world wants a U.S.-centered perspective on things. Or, more accurately, the degree to which they want to pay for one when CNN and plenty of American digital outlets offer it up for free. Some smart people with transnational media experience — including Bloomberg Media CEO Justin Smith and Condé Nast’s Wolfgang Blau — had some thoughts on the scale of that opportunity on Twitter this morning, to which Lydia Polgreen, editorial director of NYT Global, responded. @Justin_B_Smith @jeffjarvis I have spent the past two years traveling the globe talking about news, and I am struck by how resonant NYT is. @lpolgreen @Justin_B_Smith That's what I'd like to hear more about. I think Guardian appeal here is it's not American. Same for NYT abroad? @jeffjarvis @lpolgreen @Justin_B_Smith I think 'New York' as part of a news org's brand name is both, a blessing and a curse. @wblau @jeffjarvis @Justin_B_Smith that is correct. New York is a global city for most people: American but also a city apart. @wblau @lpolgreen @Justin_B_Smith That was true of New York Magazine as well, which is why they started new, successful brands. @Justin_B_Smith thanks for rooting for us! Luckily we are a subscription business and not seeking scale for its own sake. @lpolgreen @Justin_B_Smith I'm curious about the value/cost of American brands not only in media today but in tech, etc. POSTED Oct. 12, 2016, 11:05 a.m.
Benton, Joshua. "Goodbye, International New York Times; hello, international edition of The New York Times." Nieman Journalism Lab. Nieman Foundation for Journalism at Harvard, 12 Oct. 2016. Web. 18 Apr. 2019. Benton, Joshua. "Goodbye, International New York Times; hello, international edition of The New York Times." Nieman Journalism Lab. Last modified October 12, 2016. Accessed April 18, 2019. https://www.niemanlab.org/2016/10/goodbye-international-new-york-times-hello-international-edition-of-the-new-york-times/.